Employee onboarding is your company’s first opportunity to make a lasting impression on your workforce. From recruitment to the orientation process to training, it is imperative to get the most from each of these activities. Good onboarding impacts your company in big ways, from increased revenue to higher employee satisfaction. VR training has many uses that can help transform your onboarding process into one that sets you apart from all of the others. Below, I’ve compiled 6 ways that you can successfully implement your own VR employee onboarding. Studies show that company culture ranks higher than even pay as a consideration when employees are making career decisions. VR training allows recruits to tour your facility and preview your team to be sure that your company is a good cultural fit. It is important that you invest in the employee experience, and VR provides the opportunity to show your recruits that you value them. Companies that make these investments earn, on average, four times more profit than those that do not. Through VR employee onboarding, you can convey dress code expectations, tours of work and break spaces, parking procedures, and anything else that you feel defines your company. You can allow them to drop into a meeting or explore company offices and locations. Employees see VR adoption as evidence that your company is projecting forward in innovation, and will help you stand out amongst other employers. As the corporate world evolves, more and more employees are working remotely from regions across the globe. One drawback of this trend is an increasingly disconnected team. A recent study found that 43% of the adult workforce felt lonely, and a mere 53% felt they had meaningful, in-person interactions on a consistent basis. Most people work best when interacting with other people. More alarming, studies also show that employees who do not feel connected to their coworkers are more likely to quit. Bringing remote workers together can be a costly initiative, adding time and costs to facilitate each in-person session. However, with VR employee onboarding, you have the capability to bring people from all corners of the globe together and can create valuable team connections. Adequately preparing your employees for workplace dangers and safety procedures can be next to impossible. Most training methods either rely too heavily on theory or are costly and dangerous to do. Keeping employees safe is the most vital task of your organization. It’s important to train employees for any risk that the work environment poses before passing along that risk to the employee. VR training comes with the advantages of both traditional eLearning and hands-on experience while eliminating the limitations of each. VR technology can simulate all of the nuances that live training can provide while removing any potential safety concerns. For example, a surgery simulation can ensure that each participant has mastered the technique before moving to a live patient. In live training, there would be the exponentially dangerous potential for loss of life as participants learn from their mistakes to hone the technique. Not all situations can be replicated in a live environment. Disaster preparedness, for example, trains for unpredictable and potentially catastrophic situations that cannot be replicated on demand in a live setting. VR has the ability to create a nuanced environment that accommodates for all of the factors your employee needs to consider to safely navigate the situation. 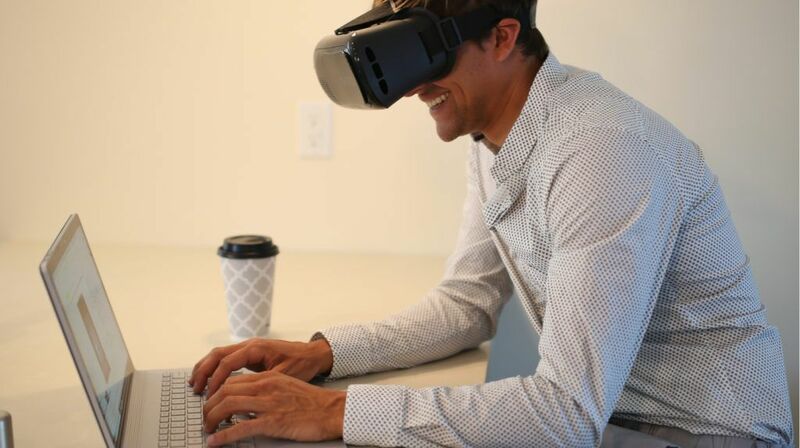 VR training also brings many of the same advantages that eLearning possesses like repeatability, scalability, and safety while taking learning beyond the theoretical realm that tends to be less impactful. Once you create the VR program, it is yours to exponentially deploy whereas a live training would incur a costly per diem charge. Studies show that employees trained with VR are twice as likely to be able to retain information two days later. The increased retention is due to the emotional tie that VR creates, a benefit that eLearning and video cannot deliver. It creates such a realistic experience for your brain that it has been effectively used to treat phobias and practice stress management. VR training brings the same benefits of live training while eliminating the less ideal factors. VR can replicate the connectedness that live training produces. Live training is often conducted by multiple instructors in multiple locations. There is no way to ensure that every audience member comes away with the same information delivered with the same message. VR can deliver an identical message throughout your entire organization. A top executive who would never have the opportunity to greet every new employee otherwise could be the VR welcoming voice, adding a layer of personal connection. Some onboarding topics may not be as inherently interesting to your employees as others, and while these topics may be very important for your organization, your employees might be checking out. VR employee onboarding eliminates the ability for your employees to be passive participants and instead immerses them in an experience that they are excited to interact with. Take fire safety, for example. Despite a company’s best-laid plans, it has been shown that in the event of a fire emergency most employees ignore training and exit via the most visible or familiar route, delaying evacuation. By providing fire safety via VR, employees cannot zone out and can experience the outcomes of their choices. In addition, the immersive environment benefits employees by encouraging focus and increasing interest, which helps to ensure training requirements are completed properly. It is a common sentiment among past and present leaders that anything worth doing is worth doing right. It’s not enough to simply develop an onboarding program. Instead, you should be analyzing your process to see what is working well and what needs revamping. VR training naturally provides opportunities to collect valuable data about its User Experience. Your participants create valuable data about how effectively and quickly they complete the task at hand, and those that are falling behind can be easily spotted. Through eye tracking analysis, you are armed with the data needed to dissect the participants every eye movement in order to create attention mapping and fine tune your design. Employee onboarding is one of the most important processes that your organization undertakes. It’s important to take every opportunity to do it well. Solve some of HR’s toughest onboarding challenges by implementing VR into your operations.